complete selection of flavors & designs. These brand new art glass confections are created using a combination of techniques. 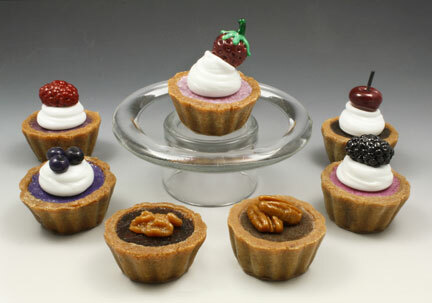 The body of the tartlet is made by the process of pate de verre with the application of glass enamels. This results in the realistic 'pie crust' look of the piece with a juicy, fruity interior. The toppings of whipped cream and fruits are added via flamework and/or pate de verre. Each of these terrific treats is the product of several trips through the kilns before they are finally completed. For online purchases please visit our shop!